Two materials made the United States the most powerful nation on earth— leather and steel. Leather boots, saddles and gun holsters were integral to America’s westward expansion in frontier times. And, when there was no more continent to discover, America’s economic rise was built on steel, as the industrial revolution produced unparalleled prosperity— and then helped us win World War II. These are the building blocks of our nation. We are proud to offer the Dual Edge Men’s Bracelet, constructed from the materials that made America great. 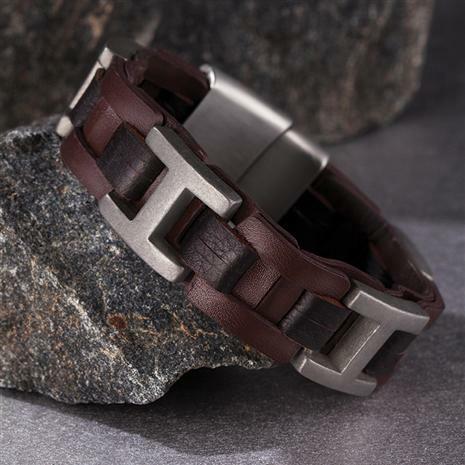 The combination of sturdy, supple leather and incorruptible stainless steel is a celebration of the past, but also represents your commitment to risk-taking and hard work, while the ingenious magnetic clasp is a reminder this is still the country of innovation and ideas. This Dual Edge Bracelet delivers a one-two punch. Fits writs to 8 ½"